This tin was smuggled back from Japan by a wonderful couple, whom I cannot name due to the nature of this business. Suffice to say, Thank You. 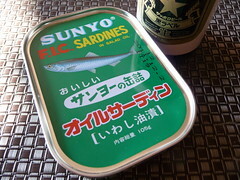 This tin has all Japanese labeling except for SUNYO F.I.C. 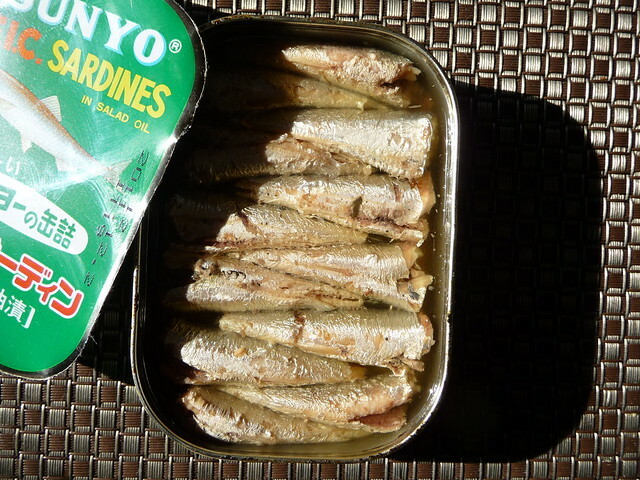 SARDINES IN SALAD OIL. Goo-Glee didn't help at all. There is no pull tab and, sadly, no tab for using a tin opener of old. Whoa. Wouldja look at that. An even dozen, small, boned, handpacked. These little bites are quite tasty. Good texture, real smokey flavor. Would be great on a party platter, due to their size, texture, and flavor. Buy a sixpack of tins, pop em all, stick tooth pics in each fish. Like those Lil Smokeys or Roasted Bacon Wrapped Shark Bites. Invite me to that party. I was worried these would be fewer and larger. But no, they are stacked in there beautifully. Perfect. Perfect for tonight. 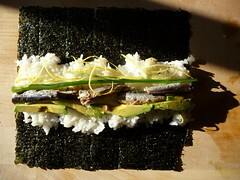 I'm rolling up these fish with real rice vinegar sushi rice, avocado, green onion and lemon zest. 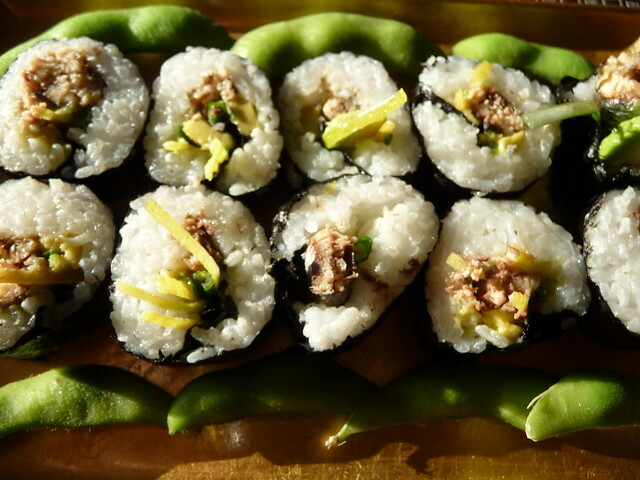 The lemon zest really brings the roll together. 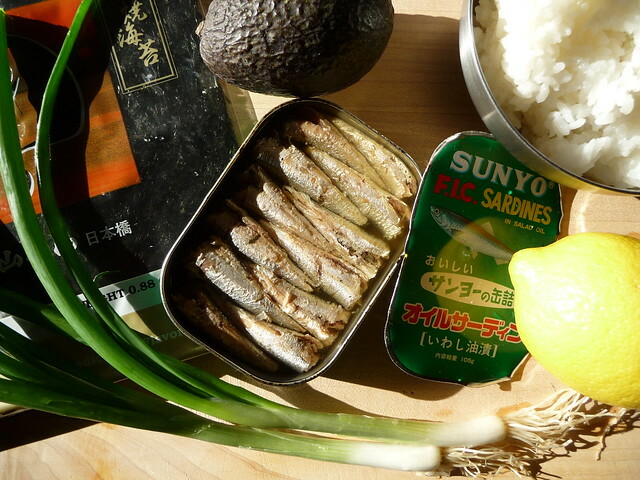 Tinned Sardine Sushi. But only with the right tin. And as Ebisu would have it, this is the tin. These fish are really good for their size and being of Asian Origin and not being masked by a soy or mustard, I like 'em. Four Tins for the Tin and The Sushi. Come On!! What the hell does F.I.C. mean? Wow, those really look like Brisling sardines and not the larger, meatier fish I've come to expect from Pacific-caught Iwashi. I wonder if they might just be packaged under a Japanese brand or if they did indeed originate from Pacific waters. Beautifully prepared and photographed as always, Jonny H! I like those big cans. Instead of prying the fish out of their tiny coffin, all I have to do is tip the can and it’s “ok, everybody out of the pool.” Of course, it looks like you’d need to take more care than that with those wee boneless specimens you have there. You, my friend, are a Lebowski Urban (over)Achiever. For those visiting Japan, these are served, in the can, as a snack at a British style bar called "Abbot's Choice" in Shibuya, Tokyo.